In Wagner’s music I find something too problematic to love, too compelling to hate. The composer’s art and thought have been a constant in my various explorations–a driving force forward to those he influenced, from Freud to Thomas Mann and Mahler, and backward, to his own sources–Goethe, Shakespeare, Greek tragedy. Who would have guessed that some four years after that July 4th weekend I would be standing on a damp train platform in Germany, headed to Bayreuth. 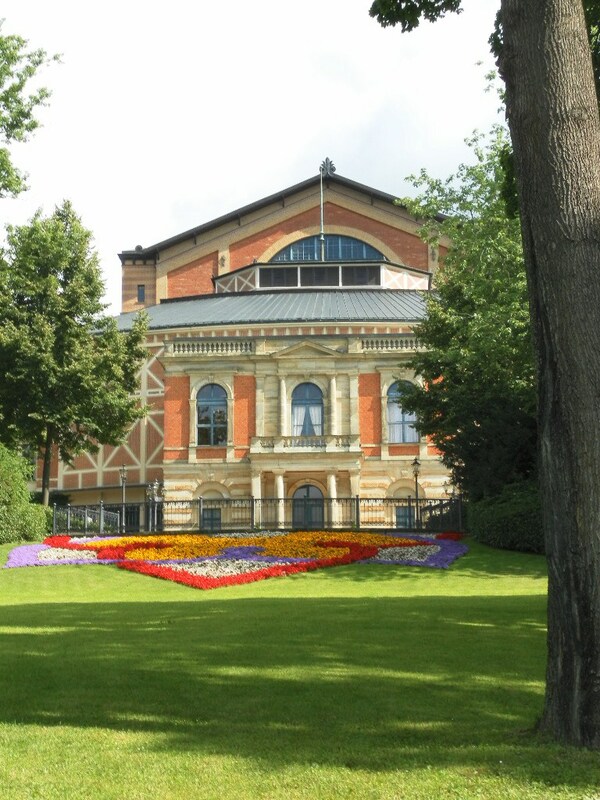 Bayreuth is Wagner’s city, the home of the opera house he designed especially for performances of his works alone. The theater is an acoustic and architectural marvel–and today, the waiting list for tickets to the festival in August is over ten years long. The first view of the Festival House, from the train station. The larger city was not overly exciting, very industrial and down-to-earth–nothing like Rothenburg’s brand of cultivated, touristy beauty. 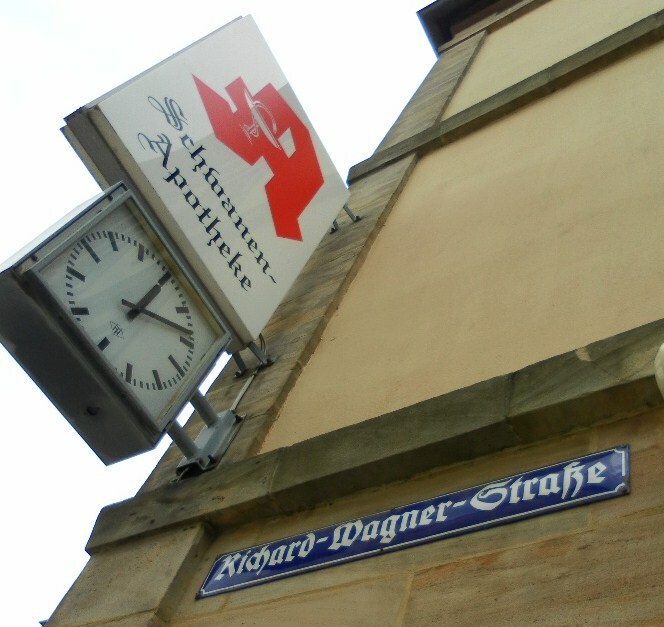 But it was immediately clear that this place, some 150 years after the composer’s death, was still Wagner’s city. 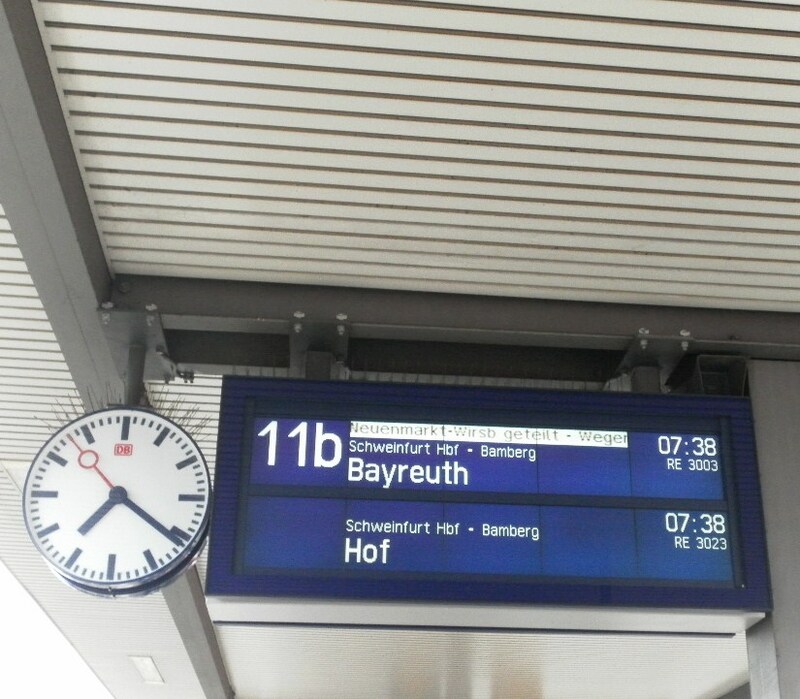 “Bayreuth, die Stadt des großen Meisters, grüßt seine Gäste,” read the enormous sign at the station. 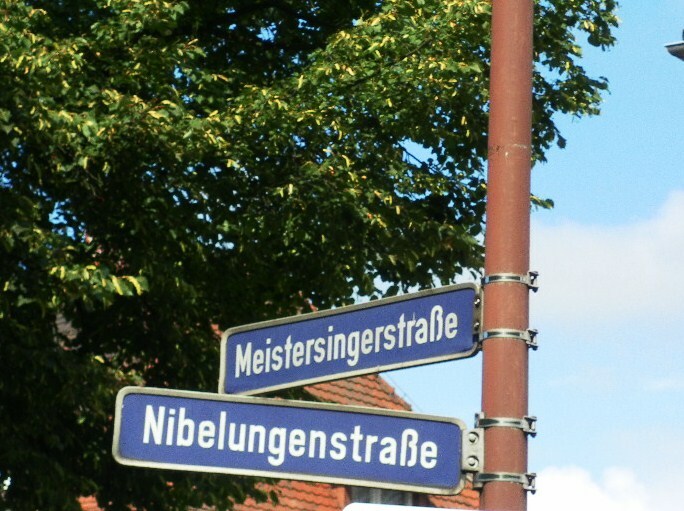 Bayreuth, the city of the great Master, greets her guests. 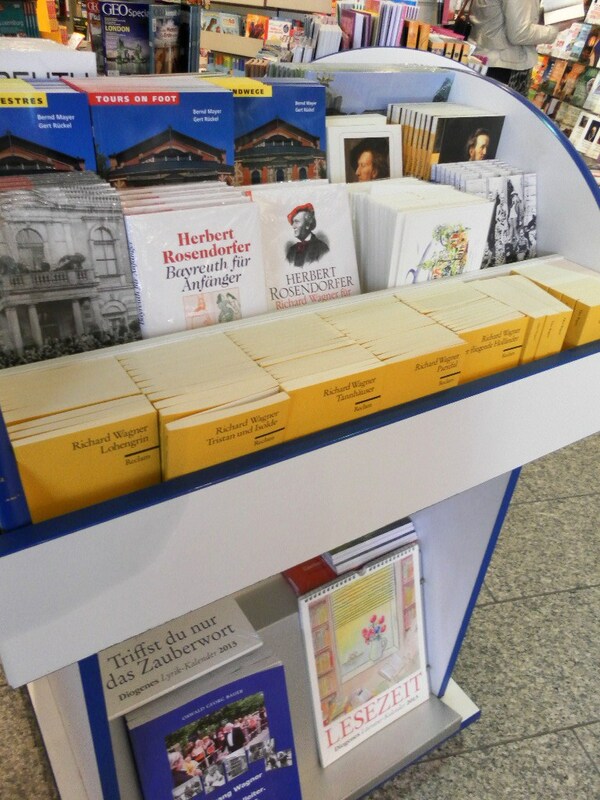 In the train station, between the tabloids and chewing gum, one could purchase Wagner’s complete libretti, copies of his essays, of Nietzsche’s Der Fall Wagner. Along the road up the Festival Hill. 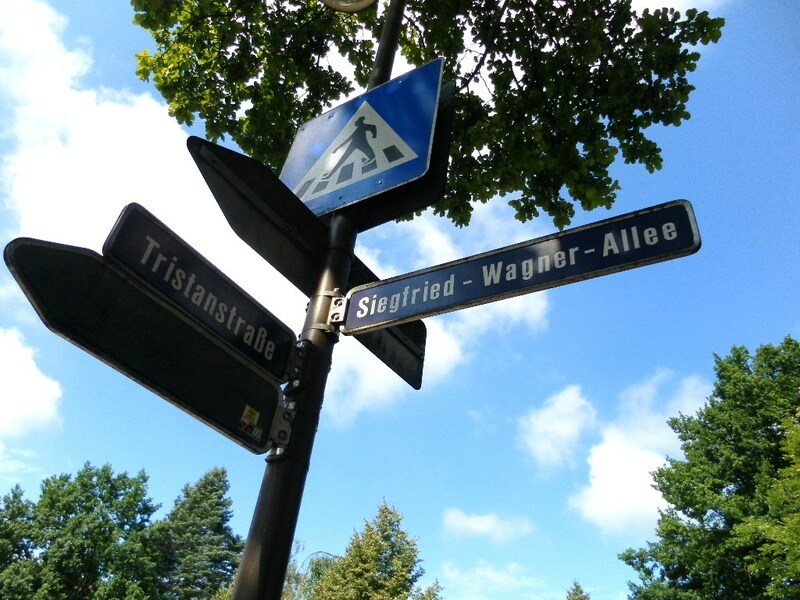 The road signs are all references to Wagner’s operas, characters, or family members. The feel of the whole city was rather odd, part cult, part kitsch, part unnerving and ever-present history. 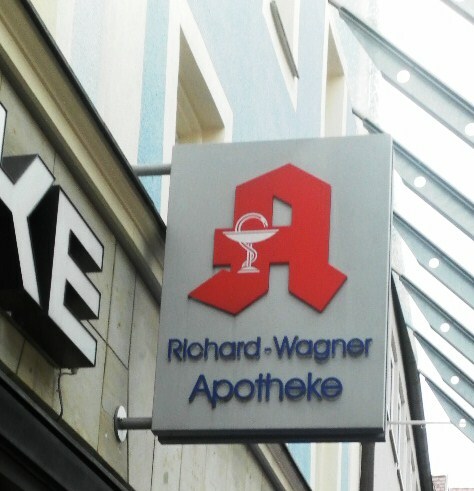 It seemed as if all the shops had to have some compulsory reference to Wagner, as if marketing potential could be increased by sticking a familiar marble bust next to the wares in the display window, or by calling the breakfast omelet special Siegfried and the wine Isolde. 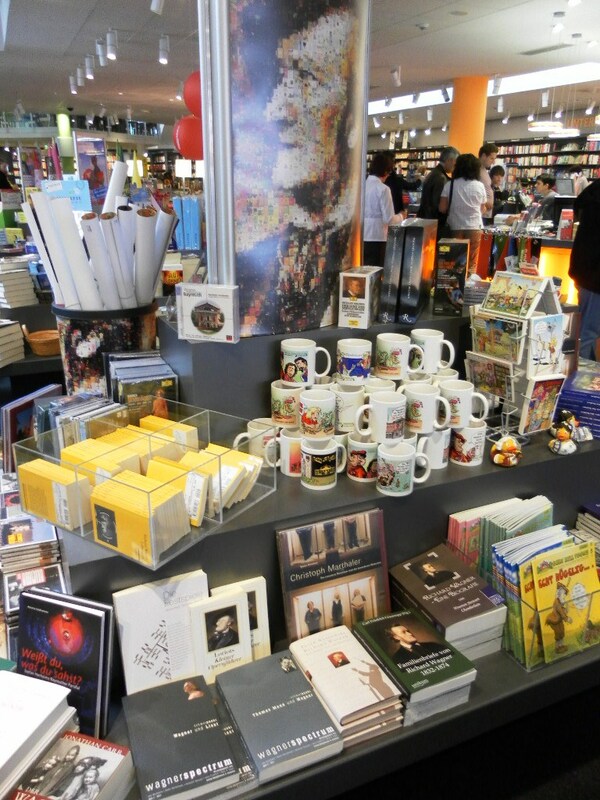 Every book store in the city had a large selection of Wagner CDs and books–and not just the usual “Opera for Dummies” types, but academic folios on Wagner and Nietzsche or Thomas Mann, published conference proceedings, three-volume biographies, Cosima’s complete diaries…. 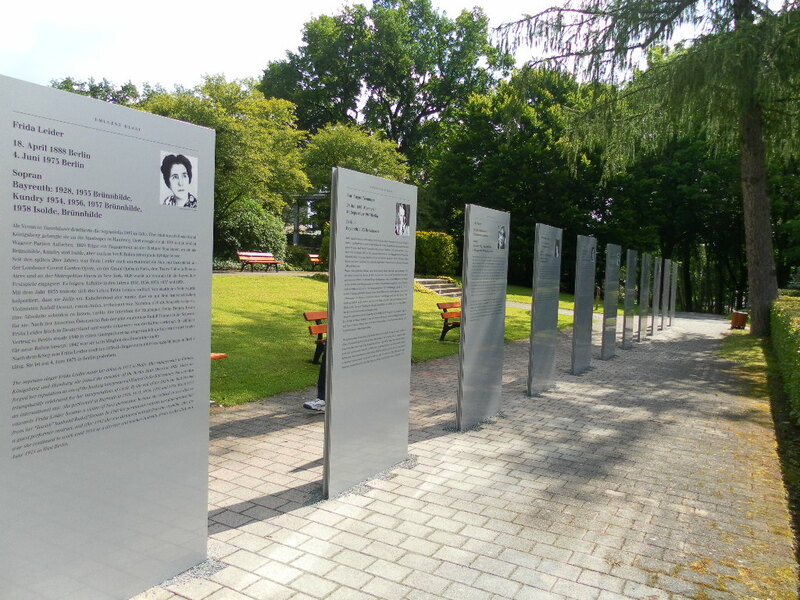 And the history…on the slope before the main entrance to the festival house, before one could climb the last set of steps to enter the building, there was an exhibition on antisemitism in Bayreuth. 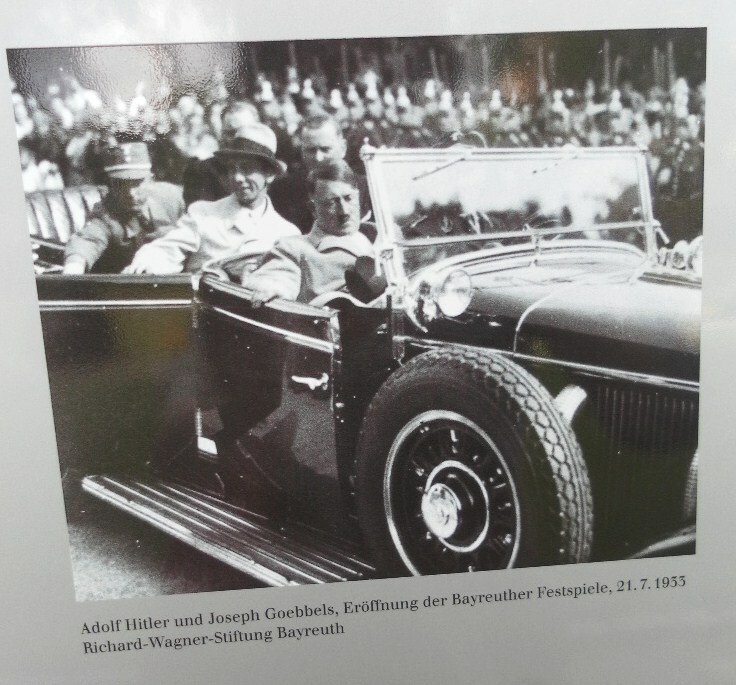 Of course we all know it and have struggled with it already, the noxious quotes from Cosima, the pictures of Hitler and Goebbels, the biographies of singers shunned from Bayreuth and later murdered. But seeing the pictures and the writing there made it all the more real. But again, this is Wagner. It would be too easy to take one’s seat in the house and just listen to the music. 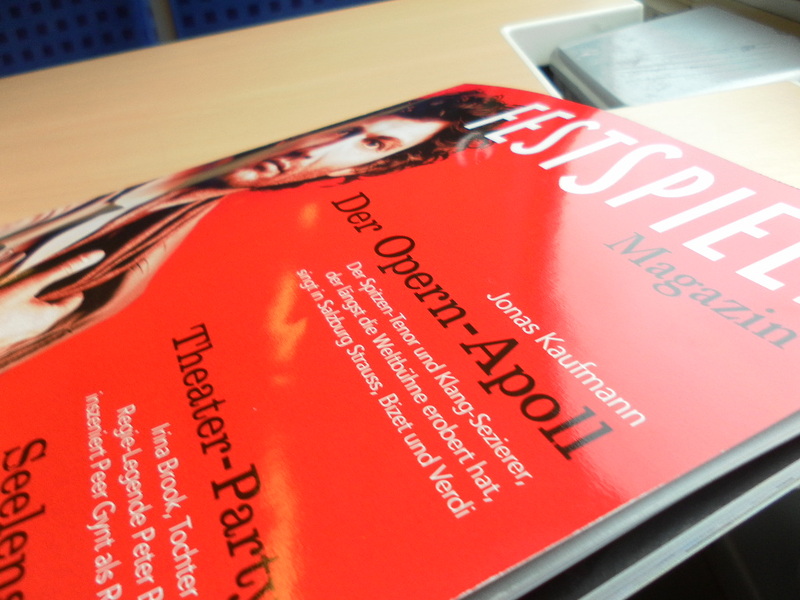 The Festspielhaus itself, finally. After the countless ornamented and excessively beautiful buildings we have seen these past few weeks, it looked very plain, almost Spartan. Inside, the walls were simply painted. The only furnishings I could see were a few benches. In the actual seating area, which I didn’t get to look at, all the seats are good–no royal box, no elaborate set-up to make the guests more interesting than the music. 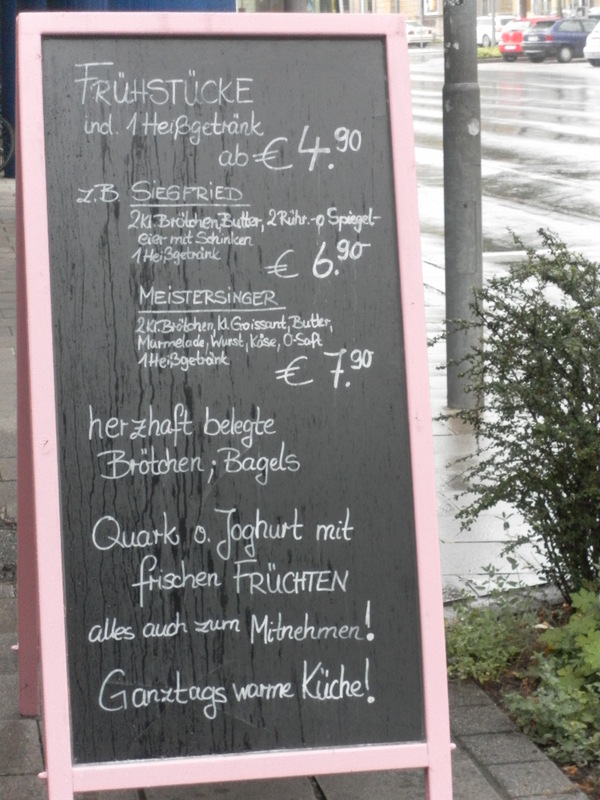 Bravo Wagner. 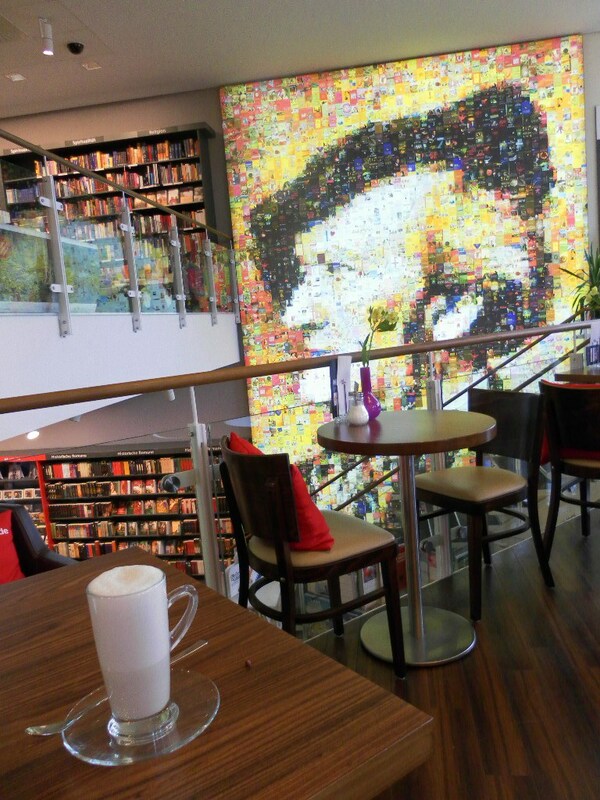 Here’s the place to be…. 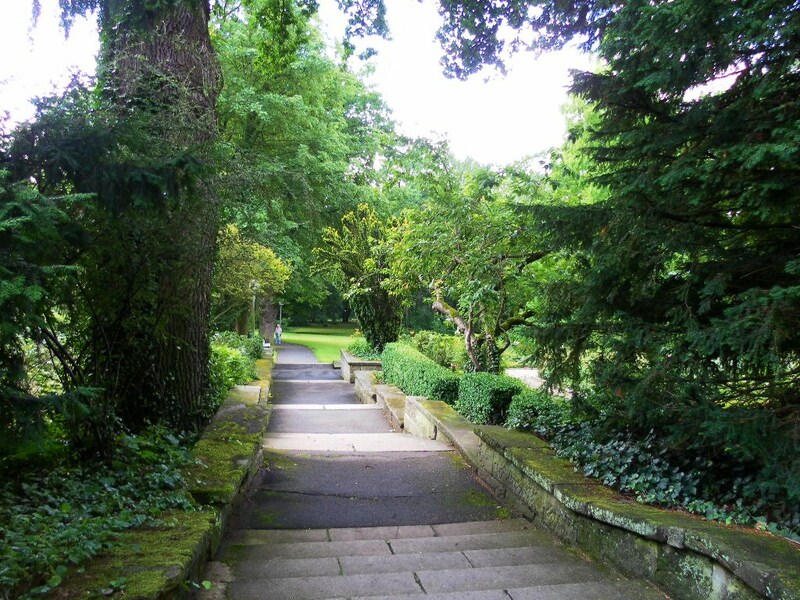 The Festival House is surrounded by lovely gardens, very green this time of year. 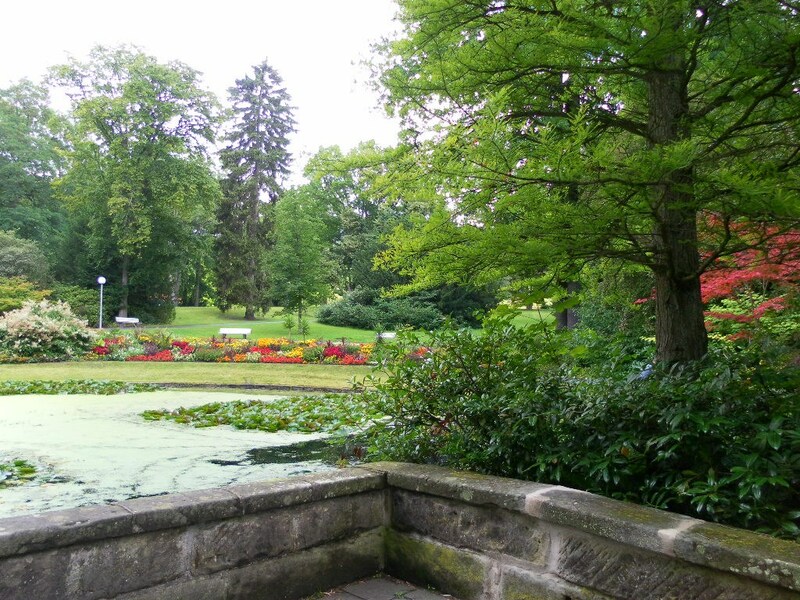 From the Festival Hill I went down into the Old City, and eventually to Villa Wahnfried, the home of Wagner from 1872 until his death in 1883. Unfortunately, the house (and thus the museum) was closed for renovations. But I was there! 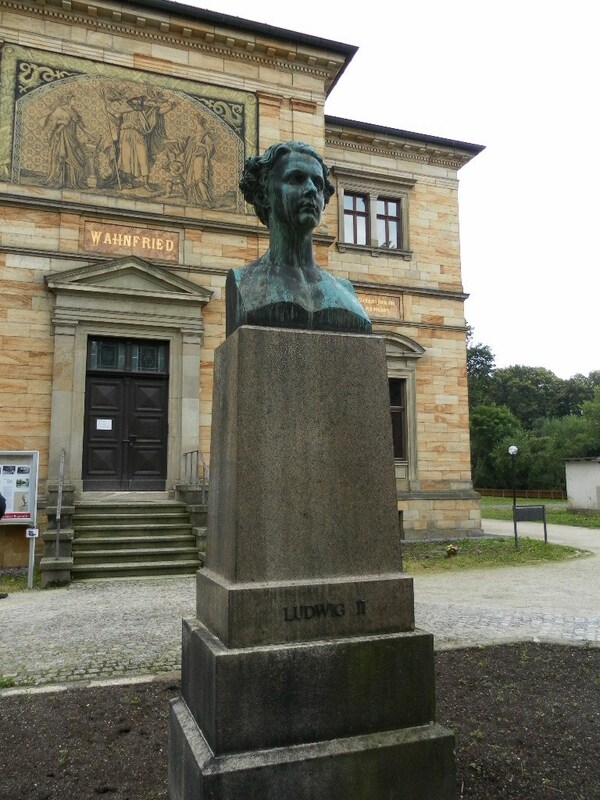 The front facade, with a statue of the crazy King Ludwig, Wagner’s obsessive (but, luckily for the composer, totally loaded) supporter and patron. 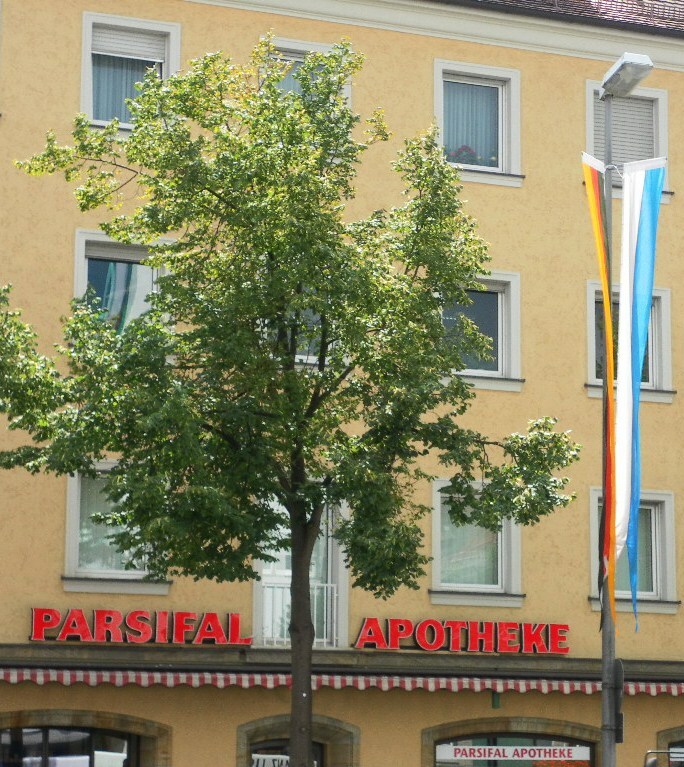 Again, the place was surprisingly unpretentious, for the home of one of the greatest figures in 19th century Europe. The house was not overly large, with that same boxy construction as the Festival House. I went and sat on the front steps for a long time. Wahnfried literally means free from illusion or delusion. 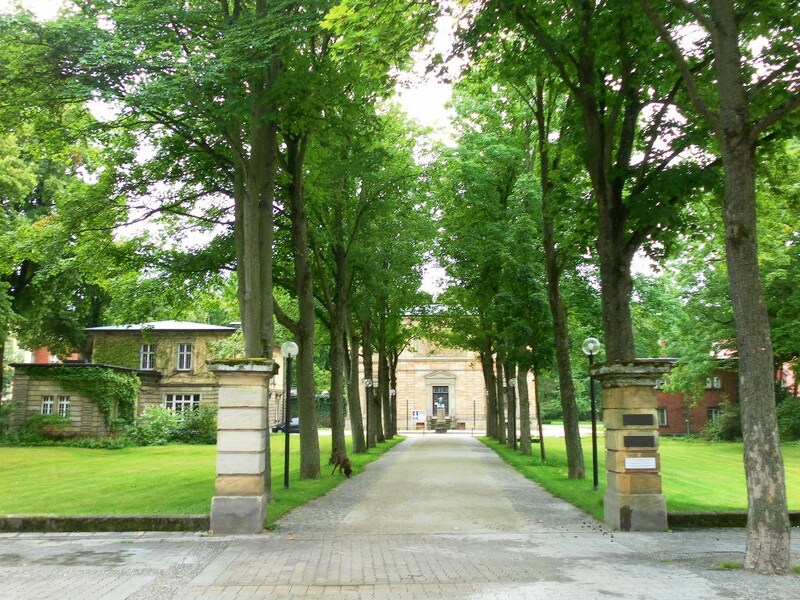 Wagner’s motto is written on the front of the house: “Hier wo mein Wähnen Frieden fand – Wahnfried – sei dieses Haus von mir benannt.” (“Here where my delusions have found peace, let this place be named Wahnfried.”) I can’t help but wonder what he meant by that. Below, the fresco or painting above the front door. 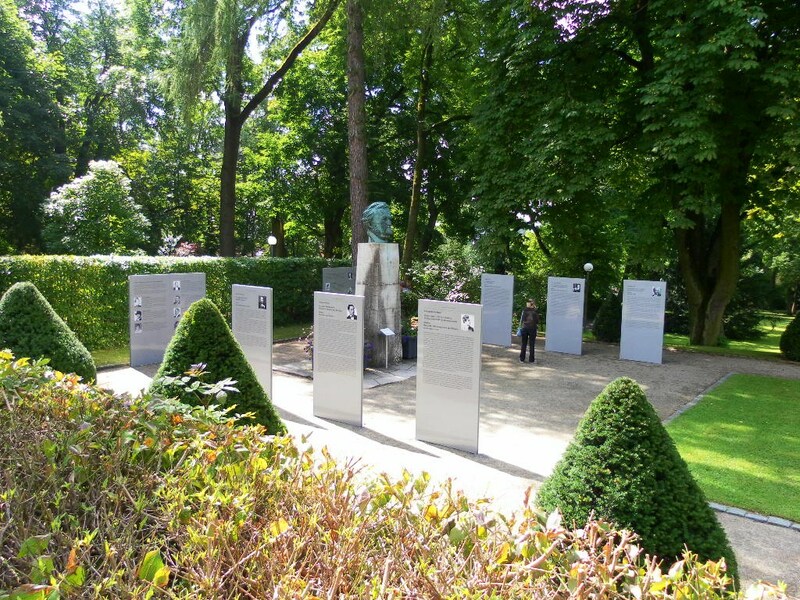 It shows Wagner in the middle as Wotan, king of the gods, with actress and lover Wilhelmine Schröder-Devrient (I think…) on the left as Drama, and wife Cosima on the right as Music. The little child is Wagner’s son Siegfried. 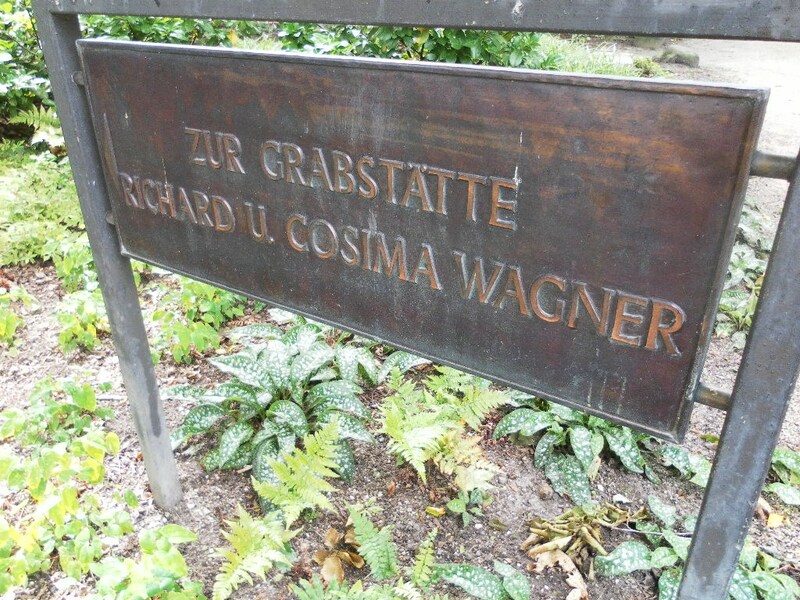 Wagner and Cosima’s grave, entirely unadorned. When I got there it started to pour rain, which was fitting. 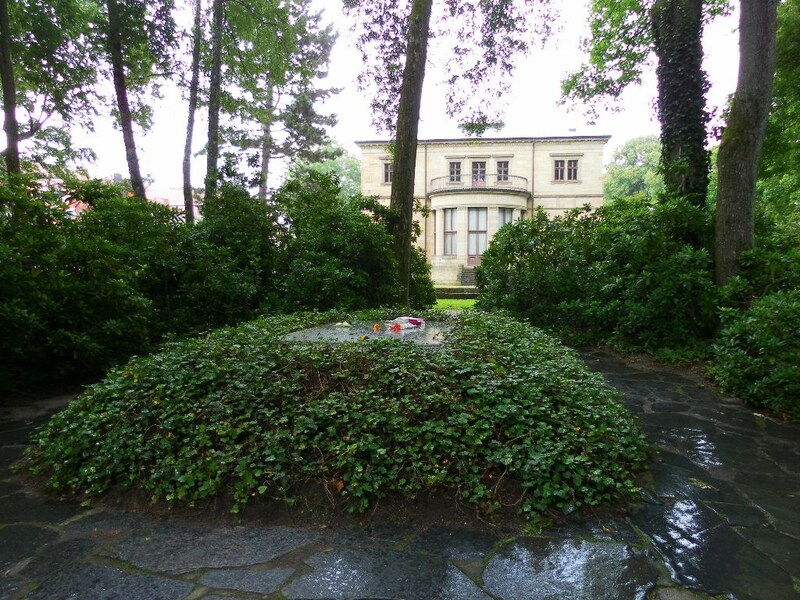 Of course such a place is remarkable not only for the presence of the artist himself, but for all that has happened afterwards, for all those who have visited to hear the same music, to see the same house and grave. 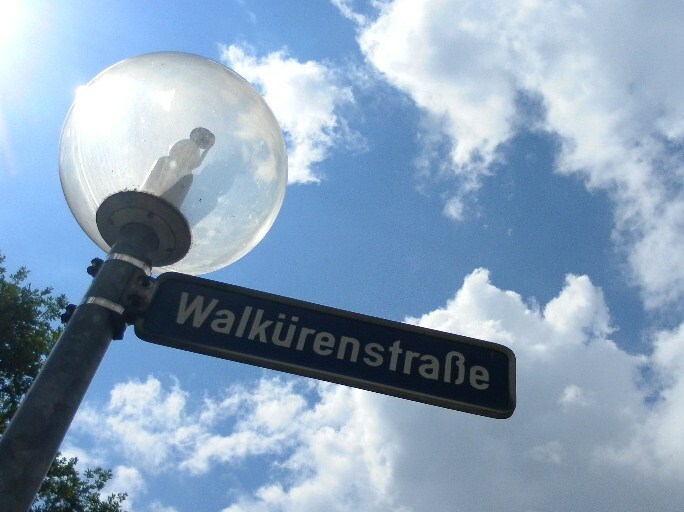 Even while Wagner was alive, of course, Europe’s intellectual and artistic elite took their way to the city, as friends, enemies, pilgrims, lovers. Franz Liszt was one such visitor, supporter, and later Wagner’s father-in-law. His house is across the street from Wahnfried. 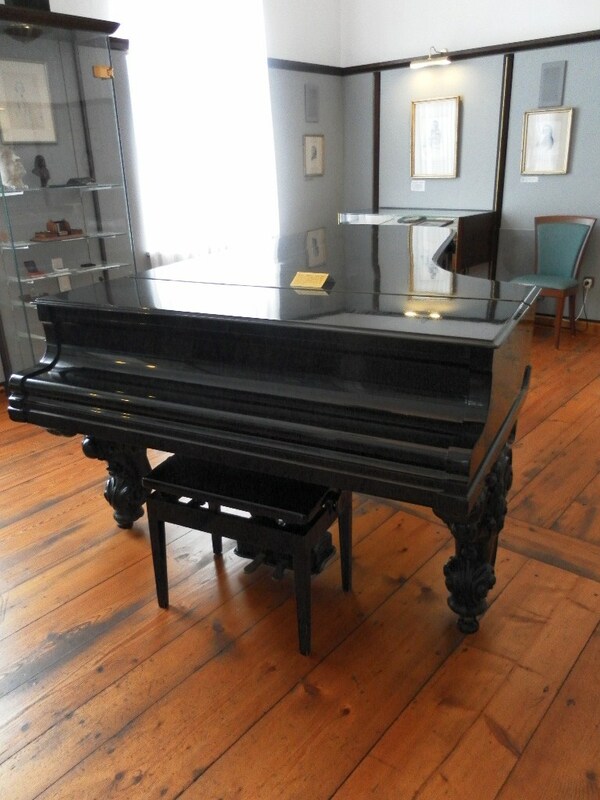 The place is now a museum, and, probably to compensate for Wahnfried being closed, has the piano that Wagner composed much of Parsifal on. Imagine! And that was all. I ate dinner in a tiny cafe next to the train station and then flew back to Würzburg, at 200 kilometers per hour in a nearly-empty train, into the sunset. It was a good day. 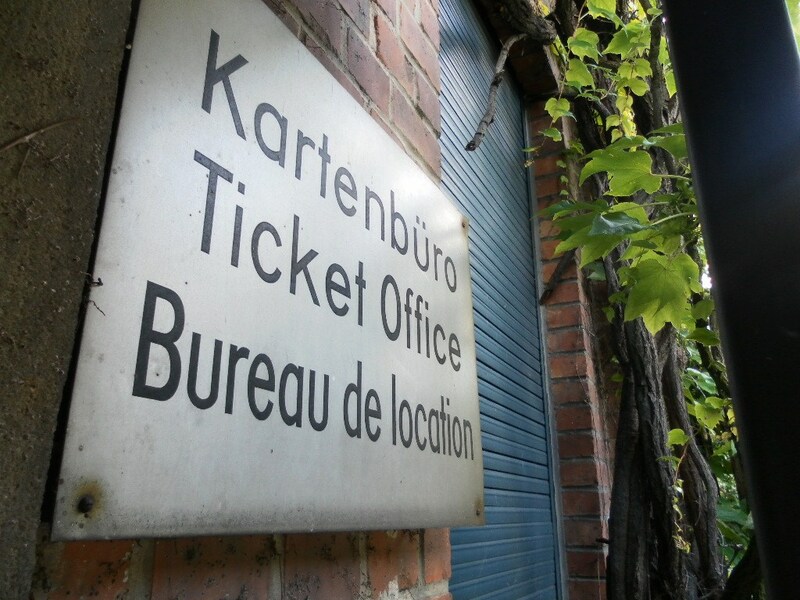 I’ll be back soon, with a ticket. 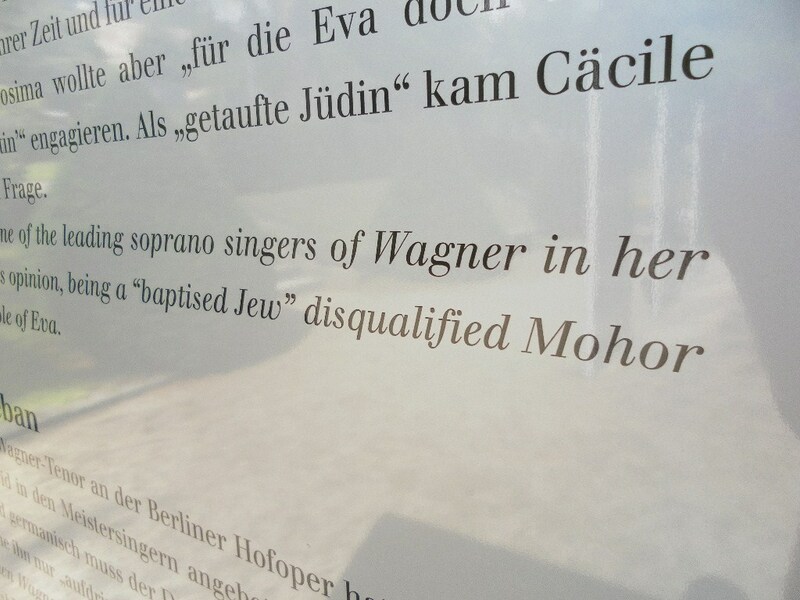 This entry was tagged antisemitism, Bayreuth, Cosima, music, opera, Wagner, Wahnfried, Wurzburg. Bookmark the permalink. sie mussen zuruckkehren MIT THEATERKARTE!!! And did you go pound out a tune on the piano? Or was it heavily guarded with a clan of Walkuries? 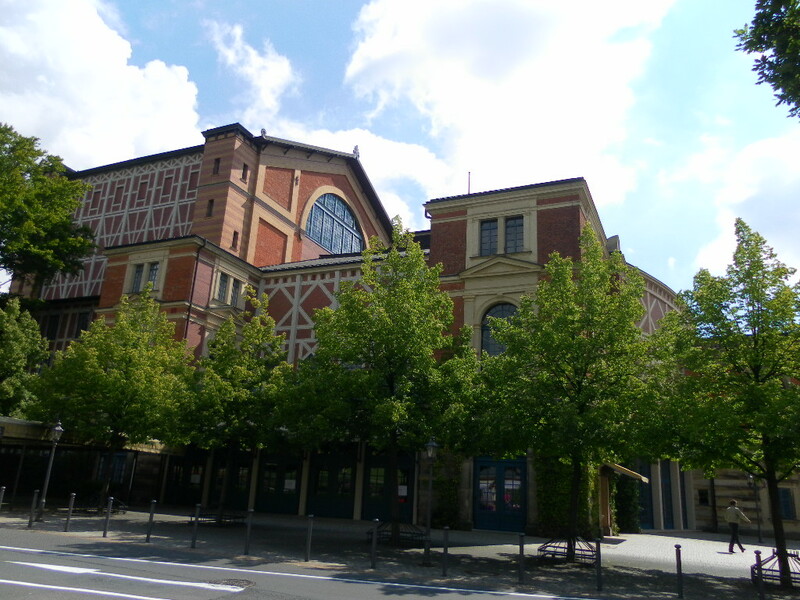 ….wonder if they will have an entire city dedicated to The Rolling Stones, 150 years after they are all dead….